Last Saturday, Marg’s BFF, Lucy, finally tied the knot. It’s been weeks/months in the making, with a storm of bride’s maid dramas, ill-fitting outfits, production line cookie baking and just general panic from all involved. Yet Saturday went by without so much as a hitch (other than the organist forgetting when she was meant to stop playing to make way for the surprise mariachi band). The wedding was so relaxed that the venerable Father Bob, who gave the service, was even able to throw a carbon tax joke into one of the readings. Once the service was over, a high tea reception was held for all guests, and then as the afternoon turned into evening a smaller number of people headed to Cutler & Co for a more intimate dinning experience. We shuffled into a cordoned off area at the rear of the restaurant, where we all stood around before dinner. Laughing, crying and trying to stand up after too many glasses of champagne. The service at Cutler was absolutely incredible; there was never an empty glass on our table, and the selection of wine was to die for. The six courses were perfectly timed, and not once was I left wondering when the next course was going to arrive. We were given a set menu, which you’ll see later on, and I loved every bit of it, particularly the braised beef cheek. There were actually three set menus: the standard menu, the vegetarian menu, and then one just for me, which forewent the seafood dishes. You sure earned that $6 toaster, Lucy. 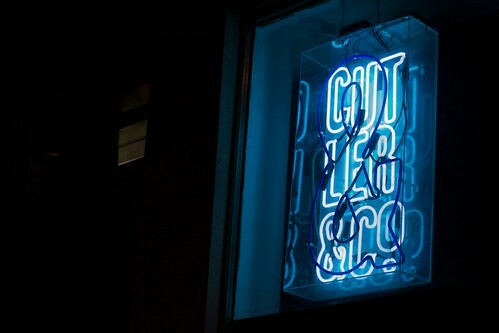 As Gerard mentioned we had dinner at Cutler & Co on Saturday night as part of my best friend’s wedding. A group of around 30 of us were set up at a curtained off section at the back of the restaurant, with beautiful tables, dreamy pendant lights, privacy and $75 Georg Jensen salt bowls (the things you learn when checking gift registries!) 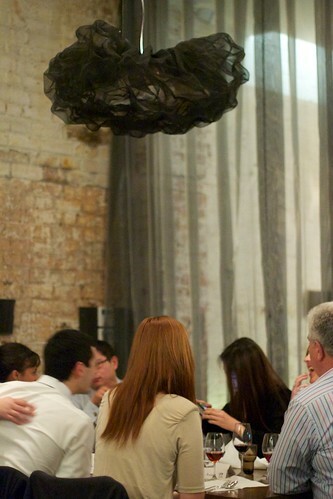 the atmosphere was perfect for a special group dinner. I loved everything about the dinner, I don’t think there was anything I could fault about the food, service or atmosphere. Actually, that’s a lie, I can tell you from experience that although the curtains on the back room provide a perfect amount of screening from the rest of the restaurant, they also hide the step down to the rest of the restaurant. Take note, this hidden step is particularly dangerous if you got up at 5am for hair & make up and are wearing 6 inch plus heels. Because I had been up since 5am (after going to bed after 2am the night before) I don’t remember much about the fit out, so I’m going to jump right in to the food. Next time Lucy gets married I’m going to go to bed earlier. 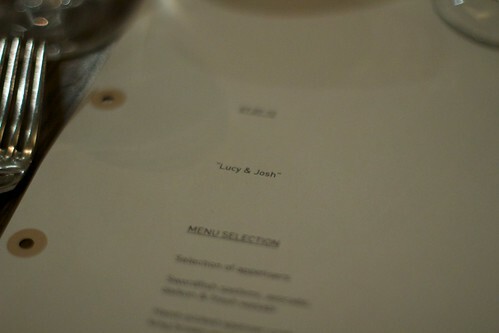 Actually, before I get into the menu I just want to say, on a personal note, Lucy & Josh – I love you both. Only about 50% because you buy me fancy food. We had a set degustation menu which I’m told was actually put together by Andrew McConnell. I bet that’s what they tell all the girls who book degustations for 30. As Gerard mentioned there was a vegetarian menu, an omnivore menu and a hybrid menu just for Gerard that replaced the seafood dishes with a mix of carnivorous and vegetarian dishes. 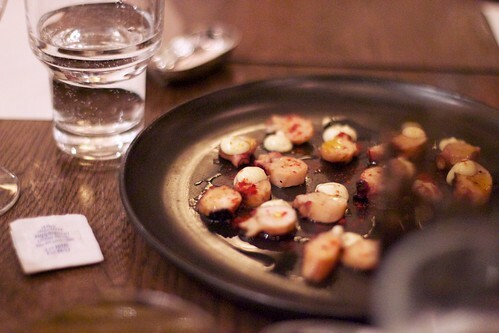 The meal started with ‘a selection of appetisers’, the first of which was fried squid. I don’t know what the sauce was, but it was delicious. 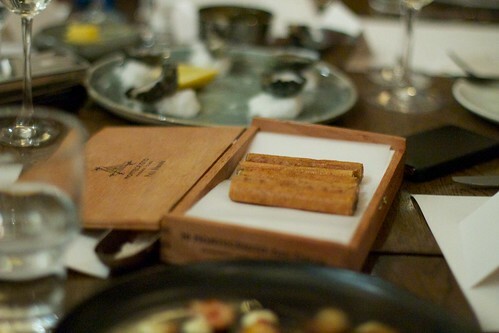 The next appetiser was a foie gras cigar (served in cigar box, cute). These were seriously delicious. Delicious, but so, so rich. The vegetarian equivalent was a porcini cigar. Finally there were oysters which I actually didn’t get to try, but they looked great. 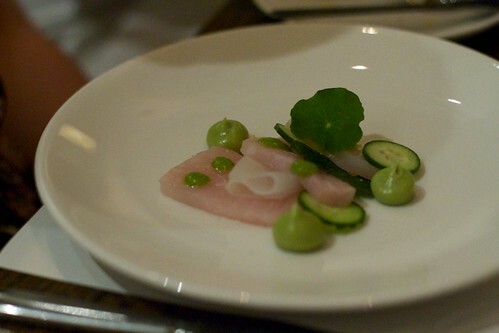 The next dish in the omnivore menu was swordfish sashimi with avocado, daikon and wasabi. The fish, understandably, tasted super fresh and there was the perfect amount of wasabi to balance the milder flavours. 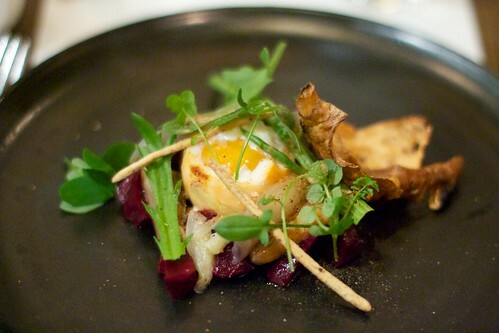 The vegetarian equivalent to the sashimi was beetroot tartare with smoked hens egg, pickled pine mushrooms & artichoke. The Gerard equivalent substituted beef tartare for the beetroot. 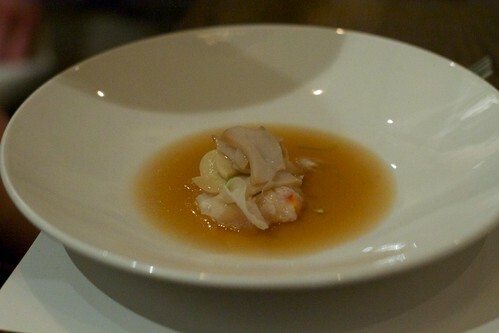 Next up was spanner crab, abalone and king brown mushroom with golden chicken broth. The crab was so tender and the broth was light but fragrant. So nicely balanced. 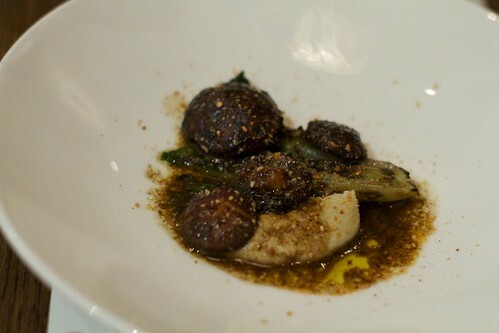 The vegetarian and Gerard equivalent was wood grilled baby cos heart, shiitake mushrooms, sesame and ginger. These mushrooms were amazing. Gerard gave me the first one because he doesn’t normally eat mushrooms but after I ate it I told him to try because it was easily the tastiest mushroom I’d ever eaten. He ate the rest. I don’t know what was in this sauce, but everyone on our table ended up using bread to try and steal some of it from the vegetarian plates. I would have eaten a bowl of it. 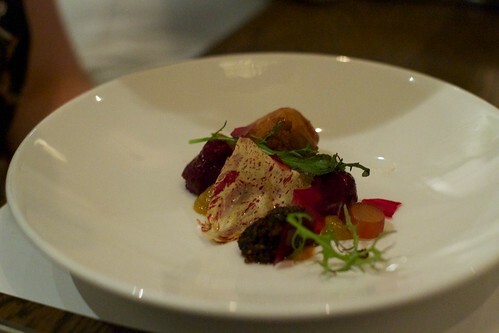 We then had smoked and fried duck, morcilla, golden raisin and beetroot. The morcilla and the fried duck were amazing, the beetroot I could take or leave. 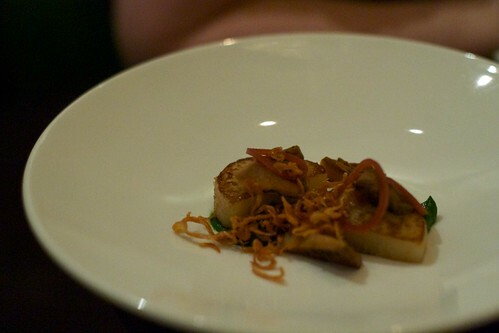 The vegetarian replacement for duck was roasted kohlrabi (a type of turnip), pine mushrooms, nettle and onion. 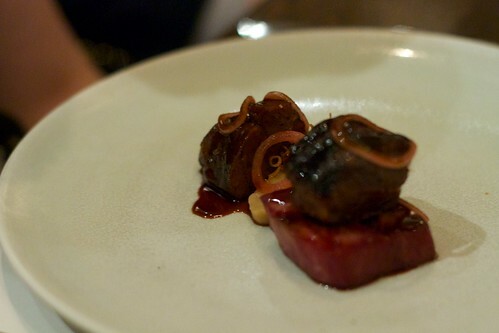 The highlight of the meal for me was the braised beef cheek, smoked tongue, roasted kohlrabi and onion soubise. A lot of people commented that the tongue was delicious and had a surprisingly intense flavour. Personally I loved the beef cheek that just fell apart when you touched it. 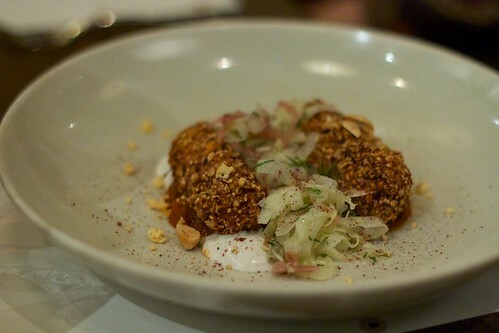 Instead of beef the vegetarians enjoyed chickpea crumbed eggplant with labne, shanklish, almonds and fennel. Looks great, but I think they missed out. Shame beef isn’t even remotely vegetarian. 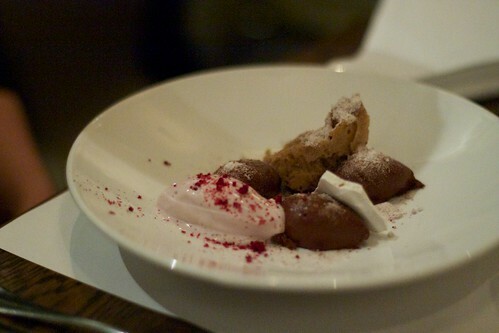 For dessert everyone had violet ice cream with chocolate ganache, sour cherry and clove meringue. 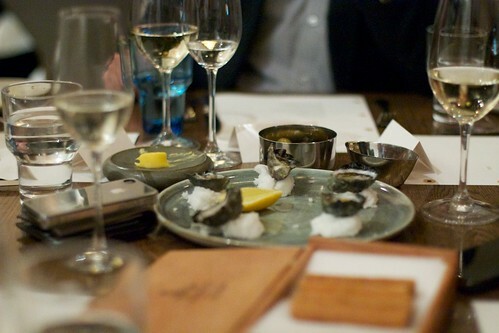 It may not be an everyday meal, but a degustation at Cutler & Co is definitely a great dining experience. Do it, just don’t send me the bill. Fantastic post – what an experience.